Holi is a time when Hindus rejoice in the victory of Prahlaad over his aunt Holika.The story is that of Prahlaad, a young and pure devotee of God. Prahlaad’s father was a powerful king who believed that everyone should worship him.Prahlaad refused to do so, due to his single-minded love of God.His father decided to have him killed. Prahlaad’s paternal aunt Holika had acquired a shawl as boon from God for various austerities she had performed. The boon stipulated that whenever she wore that shawl, she would be protected from fire.So, Prahlaad’s father and his sister Holika devised a plan in which she would wear the shawl and hold Prahlaad tightly in her arms as they sat in a fire. In this way, Prahlaad would be killed, but she would emerge without being burned.However, (as divine plans often work!) a strong gust of wind came and blew the shawl off her, and at the same time it carried the pure Prahlaad to safety. Holika was burned in the fire of her own evil. The Puranas describe Holi as a celebration of this victory of virtue over vice. One of the great obstacles in life to our spiritual progress is the difference between what we do or say and how we really are on the inside.Holika had performed certain austerities by which she was entitled to this boon from God. On the outside, she was “pious”.However, inside she was not pure. Prahlaad, on the other hand, was a simple, pure and loving devotee of God.This is what saved him. Thus, on this auspicious occasion of Holi, we should pray to be filled with the purity and devotion of Prahlaad. We should commit ourselves to performing puja, meditation and japa with focus, dedication and deep love for God. A meaning of the word Holi is sacrifice. 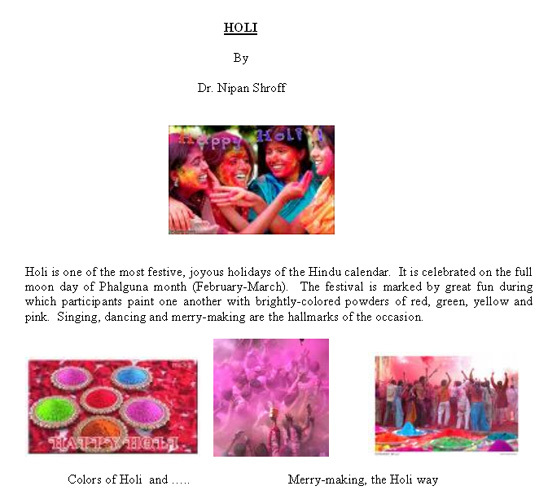 On Holi, we light so many bonfires, have fun and joy and burn the effigies of Holika. The significance of these bonfires is that of burning that which is devilish and impure, leaving only the purity and divinity after Holi. The fire of purity and divinity which we light on Holi must burn continuously in our hearts throughout the year. We must have an ever-burning bonfire, so that we are continuously renewed, continuously purified and continuously rejuvenated. For some it is the festival of springtime, the heralding of warm weather and bidding farewell to the winter. It is also seen as a festival of love, the return of fertility and virility. In some parts of India the story of Holi is one of Kamadeva (god of love), whom Lord Shiva burned to ashes as he (Kamadeva) tried to seduce Him out of His meditation.The message is: celebrate love, but don’t get carried away. Thus, Holi is a celebration of divinity and discipline over passion.Some devotees of Holi celebrate the occasion for the love between Lord Krishna and his consort Radha. This is especially so in the towns of Vrindavan and Mathura, the two towns Krishna frequented.